Mobile-first indexing what does it mean for SEO? Home » Blog » Google’s mobile-first indexing: what does it mean for SEO? Google has announced that mobile-first indexing is now rolling out, almost a year and a half since it originally unveiled plans to change the way it ranks mobile and desktop pages. During this time, the search giant has been experimenting and testing the implementation of a mobile-first search experience and now it’s ready to roll out the new system. There’s also been a lot of talk about mobile-first indexing over the past year and it’s come with a certain degree of confusion and conflicting reports. So, now that Google is officially rolling out mobile-first indexing, we’re going to explain exactly what this means for SEO and what you need to do about it. That’s about the best quick description of mobile-first indexing that we’ve seen over the past year, including previous Google explanations. Essentially, it all comes down to the fact that the majority of Google searches are made on mobile but the results are still formulated by a system that ranks desktop pages first. The problem is, mobile pages often differ from their desktop alternatives and it makes little sense to send people to pages optimised for desktop when they’re using mobile. Mobile-first indexing shifts the priority to the mobile version of pages to create better results and experiences for Google’s predominantly mobile users. This doesn’t mean Google is going mobile-only or creating a separate index for mobile and desktop results. It simply means mobile pages will be crawled first and Google will fall back to desktop if no mobile version is found. Of course, this raises a few questions and we’re going to address as many of these as we can in the remainder of this article. Although mobile-indexing sounds like a huge deal that’s going to change the way Google Search operates, the impact on most SEOs and website owners will be minimal. We’re certainly not looking at another mobilegeddon and there’s no need to panic as mobile-first indexing rolls out. However, it’s important to know whether you will be affected or not, by how much and what you need to do about it. These are the kind of questions we’re going to answer now. 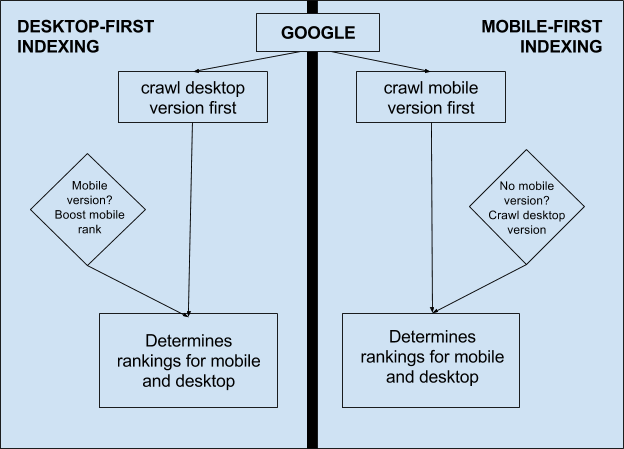 As the graphic shows, mobile-first indexing changes the default behaviour of Google for each search so that it crawls the mobile version of your page when there’s one available. When there isn’t a separate mobile version, Google reverts to indexing your desktop page and determines its ranking as normal. How will this affect my search ranking? This depends entirely on how your website and pages are optimised for mobile. 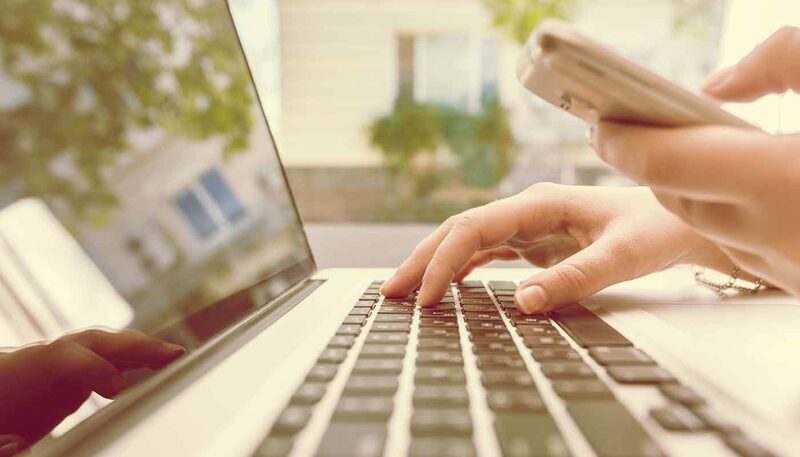 Firstly, if your website is designed responsively – in other words, your mobile and desktop pages are one and the same – then you shouldn’t be affected by mobile-first indexing. In these cases, your mobile and desktop pages are the same and simply adapt to accommodate different screen sizes, which is the design approach Google recommends for mobile optimisation. Most of the potential problems here come down to poor mobile optimisation so follow the usual best practices and you should be fine. However, there are a couple of technical SEO issues that could cause serious problems if you don’t know what to look out for. First of all, make sure the mobile and desktop versions of each page are both verified in Search Console. Secondly, the link profile for your mobile pages will be different from their desktop versions, for better or worse. Which means you could see a change in ranking based on the quality of link profiles your mobile pages currently have. Your site is desktop only and doesn’t have a mobile-friendly version. Your site adjusts for screen size. Each desktop URL has an equivalent different URL that serves mobile-optimised content. This site type is also known as an m-dot site. Google prefers the mobile URL for indexing. To prepare for mobile-first indexing, follow our best practices. Your site serves different content based on the user’s device. Users only see one URL. Google prefers the mobile optimised content for indexing. To prepare for mobile-first indexing, follow our best practices. Google prefers the mobile version of the non-AMP URL for indexing. If your non-AMP mobile version uses dynamic serving or separate URLs, follow our best practices. As you can see, mobile-first indexing should only affect you if you have separate mobile and desktop pages or dynamically serve content – neither of which is recommended, especially dynamic content. However, if you are using either of these methods for mobile optimisation, there are a number of best practices you can follow to minimise the impact of mobile-first indexing. What should I do ahead of mobile-first indexing? If you serve separate mobile and desktop pages or use dynamic content delivery for different device types, make sure you have the following covered before mobile-first indexing rolls out. Once again, all of these points are part of the usual mobile optimisation best practices and none of this should be new to you. There’s nothing wrong with having separate mobile and desktop sites, as long as they’re optimised correctly, and – let’s be honest – there are plenty of responsive websites that are poorly optimised for mobile. If it’s going to take a lot of work for you to get your pages ready for mobile-first indexing, then it might make sense to make the jump to a responsive design while you’re at it. However, a well-optimised experience shared across mobile and desktop pages is always going to be better than a poorly optimised responsive experience – so don’t lose sight of the end result for the sake of a more popular process. How will I know when my site is migrated to mobile-first indexing? After this, you’ll see a significant increase in crawl rate from Google’s mobile bot and the mobile version of your pages will start showing in search results (if you have separate mobile pages). For responsive and desktop-only websites, nothing should change, aside from the increased crawl rate, but it’s a good idea to run an audit after you get this notification to make sure nothing out of the ordinary is going on. The main takeaway from our look at mobile-first indexing today is there’s nothing to panic about. If you happen to run separate mobile and desktop pages, you still shouldn’t experience any major issues unless your mobile optimisation strategy in need of an update. Either way, it’s a good idea to run the necessary checks before mobile-first indexing is enabled for your site, even if you expect nothing to change after the switch. If you need any help with running audits before or after mobile-first indexing, get in touch with our team of technical SEO experts today. Having a website that doesn’t work on mobiles and tablets is like jamming your shop door so only a few people can enter. You’re blocking out an increasing source of potential customers and the revenue they could produce. Getting your website responsively designed is flinging the shop door open and letting the crowds in.